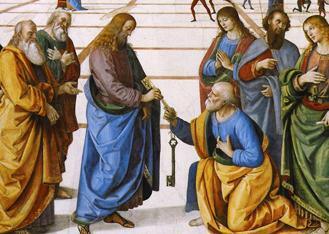 Some Christians argue that Apostles are always brought into their office under the facilitation of another Apostle, like a chain of links succeeding each other. In the Old Testament, prophets seem just to appear under the direct authority of God, but it makes me wonder is there is any tradition that puts the 'succession' concept upon their view of the Prophets also? The only 3 Traditions that teach apostolic succession are Catholicism, Orthodoxy, and Anglicanism. These Traditions do not argue for prophetic succession, simply because the biblical role of prophet is inherently different from the biblical role of apostle, making it impossible to conceptually assign succession to both. First, let’s compare the words apostle and prophet to see how they match up. The word "Apostle", from the Greek apostello "to send forth", "to dispatch", has etymologically a very general sense. Apostolos (Apostle) means one who is sent forth, dispatched--in other words, who is entrusted with a mission, rather, a foreign mission. It has, however, a stronger sense than the word messenger, and means as much as a delegate. In the classical writers the word is not frequent. In the Greek version of the Old Testament it occurs once, in 1 Kings 14:6 (cf. 1 Kings 12:24). In the New Testament, on the contrary. it occurs, according to Bruder's Concordance, about eighty times, and denotes often not all the disciples of the Lord, but some of them specially called. It is obvious that our Lord, who spoke an Aramaic dialect, gave to some of his disciples an Aramaic title, the Greek equivalent of which was "Apostle". It seems to us that there is no reasonable doubt about the Aramaic word being seliah, by which also the later Jews, and probably already the Jews before Christ, denoted "those who were dispatched from the mother city by the rulers of the race on any foreign mission, especially such as were charged with collecting the tribute paid to the temple service" (Lightfoot, "Galatians", London, 1896, p. 93). The word apostle would be an exact rendering of the root of the word seliah,= apostello. The biblical usage of the word apostle denotes one who is commissioned by Jesus and is sent forth with divine authority. The New Testament writers commandeered the word apostle to specifically distinguish the new teaching office (magisterium) commissioned with Divine authority. [W]here in practice was [the] apostolic testimony or tradition to be found? . . . The most obvious answer was that the apostles had committed it orally to the Church, where it had been handed down from generation to generation. . . . Unlike the alleged secret tradition of the Gnostics, it was entirely public and open, having been entrusted by the apostles to their successors, and by these in turn to those who followed them, and was visible in the Church for all who cared to look for it. For the early Fathers, "the identity of the oral tradition with the original revelation is guaranteed by the unbroken succession of bishops in the great sees going back lineally to the apostles. . . . [A]n additional safeguard is supplied by the Holy Spirit, for the message committed was to the Church, and the Church is the home of the Spirit. Indeed, the Church’s bishops are . . . Spirit-endowed men who have been vouchsafed ‘an infallible charism of truth. (Early Christian Doctrines, 37). Judging from a comparative examination of the cognate words in Hebrew and the other Semitic tongues, it is at least equally probable that the original meaning of prophet was merely: to speak, to utter words (cf. Laur, "Die Prophet ennamen des A.T.", Fribourg, 1903, 14-38). The historic meaning of nabî' established bybiblical usage is "interpreter and mouthpiece of God". This is forcibly illustrated by the passage, where Moses, excusing himself from speaking to Pharao on account of his embarrassment of speech, was answered by Yahweh: "Behold I have appointed thee the God of Pharao: and Aaron thy brother shall be thy prophet. Thou shalt speak to him all that I command thee; and he shall speak to Pharao, that he let the children of Israel go out of his land" (Exodus 7:1-2). Moses plays towards the King of Egypt the role of God, inspiring what is to be uttered, and Aaron is the prophet, his mouthpiece, transmitting the inspired message he shall receive. The Greek prophetes (from pro-phanai, to speak for, or in the name of someone) translates the Hebrew accurately. As noted above, the biblical use of prophet seems to be generalized as someone who is called up by God to speak as His “mouthpiece.” The prophets of the Old Testament were not called by God to perpetuate a successive office, but were called up from among God’s people for a specific time, place, and purpose. Although succession of prophecy isn’t explicitly displayed in the Old Testament, succession of authority, is very evident in the Old Testament. The succession of official authority in the Old Testament foreshadows not only apostolic succession, but also apostolic authority as well. There is a passage in the Old Testament where Isaiah is prophesying that there will be a dramatic change in the Kingdom of David. Here we find an example of a prophet prophesying that a change will take place in the successive office of the king’s royal steward, or vizier. Speaking for God, Isaiah proclaims, “And I will place on his (Eliakim’s) shoulder the key to the house of David; what he opens no one can shut, and what he shuts no one can open.” King Hezekiah ascended to the throne of David in 715 b.c. and ruled the land of Judah. The key of David was on the shoulder of Shebna, the royal steward. Isaiah prophesies that Shebna will be removed from his office and the key of David will be given to Eliakim, his successor. The key of David, the key of God’s kingdom, belongs to Jesus. He has come to restore the throne of David. God binds himself with his people with covenants. God made a covenant with David that his throne would be forever. The kings of the Davidic covenant were the proud possessors of the “key of David,” signifying unquestioned royal authority. Jesus possesses these keys as the heir to David’s throne, and he established a new covenant, and eternal covenant. This covenant was for all men, and was not limited to the Jews of the Nation of Israel. The keys of a kingdom have always been the sign of authority, and they belong exclusively to the king. Kings, however, would delegate the keys to the stewards or viziers of their kingdom. Jesus ascended to the throne of David and then, through his death and resurrection, extended the covenant to all men, not just to the Jews. God gave him all authority in heaven and earth; he was now king of the eternal kingdom of God. He was the proud possessor of the royal keys of God’s kingdom. Roughly 750 years after Isaiah delivered God's message of this shift in authority, Jesus resurrects this message in order to signify that the time has come for the true King to ascend the throne of David. We read in the Gospel of Matthew that Jesus recites the passage in Isaiah 22 practically verbatim. Both passages are identical in 2 key ways. Both involve the key of the house of David, and both involve the juridical authority to bind and loose in the name of the King. Later, in Matthew 18, Jesus also authorizes this power to bind and loose for the rest of the Apostles. Just as the Old Testament clearly testifies to an office of succession within the kingdom of God, the New Testament also indicates that Jesus established offices of succession. There are other examples that imply succession in the Old Testament, but they do not directly pertain to any of the prophets. In Exodus 18:25-26, Moses appoints various heads over the people of God. We see a hierarchy, a transfer of authority and succession. And choosing able men out of all Israel, he appointed them rulers of the people, rulers over thousands, and over hundreds, and over fifties, and over tens. And they judged the people at all times: and whatsoever was of greater difficulty they referred to him, and they judged the easier cases only. Numbers 3:3 shows us that the sons of Aaron were formally "anointed" priests in "ordination" to minister in the priests' "office." Numbers 16:40 displays God's intention of unbroken succession within His kingdom on earth. Unless a priest was ordained by Aaron and his descendants, he had no authority. The passage in Numbers 27:18-20 shows God's intention that, through the "laying on of hands," one is commissioned and has authority. And the Lord said to him: Take Josue the son of Nun, a man in whom is the Spirit, and put thy hand upon him. And he shall stand before Eleazar the priest and all the multitude: And thou shalt give him precepts in the sight of all, and part of thy glory, that all the congregation of the children of Israel may hear him. We see that in Deuteronomy 34:9 that Moses laid hands upon Joshua, and because of this, Joshua was obeyed as successor, full of the spirit of wisdom. The question, “..is there is any tradition that puts the 'succession' concept upon their view of the Prophets also?” is obviously directed toward Catholicism, Orthodoxy, and Anglicanism. These are the only 3 “traditions” that teach apostolic succession. As demonstrated above, the biblical role of prophet is inherently different from the biblical role of apostle, therefore making it impossible to conceptually assign succession to both. This is why none of these 3 "traditions" argue for Old Testament prophetical succession. Not the answer you're looking for? Browse other questions tagged prophets apostolic-succession or ask your own question.